A reverse osmosis (RO) unit might be an overwhelming aquarium equipment, but once you get to know its functions and its benefits, you might be considering to get one. A reverse osmosis (RO) unit comes in handy when you want to have clean, safe, pure and high-quality water for your aquarium. This article will discuss the basic things that you need to know about reverse osmosis systems and show our top picks for the best units out there. Quick Look: Top Rated Aquarium Reverse Osmosis SystemsWhat Is The Reverse Osmosis Process? What Are The Benefits Of Having A Reverse Osmosis System For An Aquarium? What Is The Reverse Osmosis Process? Using untreated tap water for your aquarium can do harm to its inhabitants. You may not see it, but there are certain bacteria, minerals and chemicals that are present in your tap water, which risks the health of your aquarium inhabitants. It contains various contaminants and impurities such as chlorine, nitrate, phosphate, copper, and other heavy metal chemicals. These contaminants and impurities make it possible for algae to grow at a harmful and aggressive rate. To counter this, applying an efficient filtration is not a bad choice. The reverse osmosis process in an RO system occurs when water is drawn through a semi-permeable membrane, which makes use of membranes made from Thin Film Composite (TFC) materials. That removes up to 99% of impurities from tap water and produces water that is free from contaminants. Installing a reverse osmosis system for your aquarium will purify your water directly from your water source. A 4-stage RO/DI unit with a deionization (DI) cartridge can produce top quality water. What Are The Benefits Of Having A Reverse Osmosis System For An Aquarium? A reverse osmosis system or reverse osmosis unit (RO) can typically have a minimum of three and a maximum of 5 stages of filtration. This ensures water that is produced after the filtration stages is safe and pure. It is capable of separating dissolved organic molecules, metal ions, and other extremely fine particles with a particle size up to 0.001 microns, from water. But that’s not all that there is to it. There are also several benefits that you can get from installing a reverse osmosis system. It is cost-effective compared to buying purified water regularly from your fish store for your aquarium. It prevents excessive algae growth which is caused by the presence of nitrate and phosphate. It is suitable for freshwater aquariums since it maintains the pH level of plants. It is ideal for saltwater aquariums which require purified water. It is ideal for reef aquariums since it manages and treats nitrate levels. The RO unit caters to both freshwater and marine aquariums. Using an RO unit in a freshwater tank will provide water without General Hardness (GH) or Carbonate Hardness (KH) which is good for plants and soft-water fish. On the other hand, using of an RO unit for reef and marine aquariums removes impurities such as phosphate, nitrate, and silicates that can affect the health of corals and the tanks inhabitants. 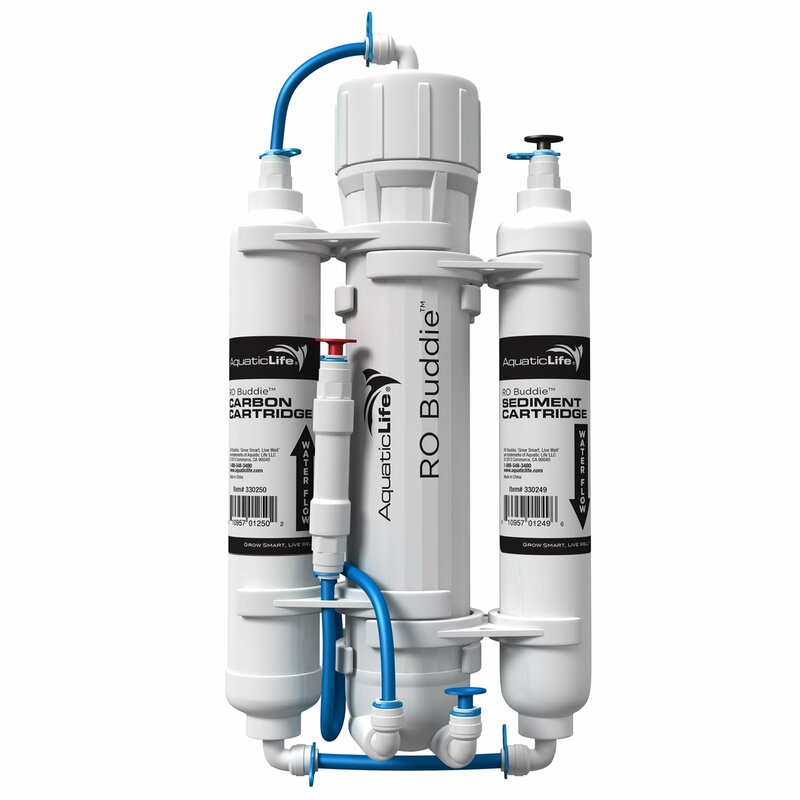 What Are The Things To Consider When Getting A Reverse Osmosis System? 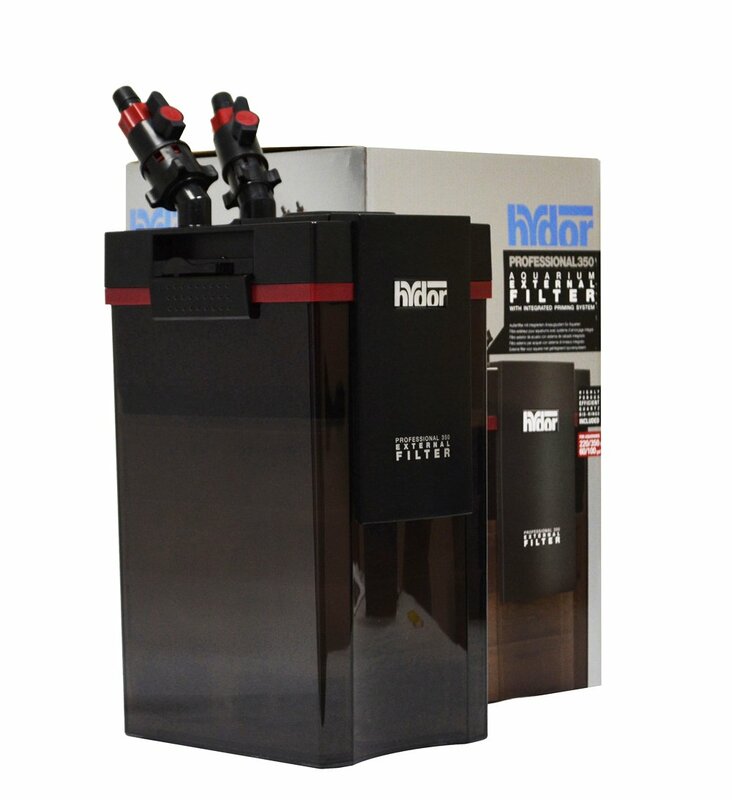 RO units are beneficial to your aquarium. But before planning on getting a reverse osmosis system for your aquarium, there are a couple of things that we would like to point out for you to consider. Pure RO water can cause drastic pH changes which can be lethal for freshwater aquarium inhabitants. You can choose the best pH meter for your fish tank here. Pure RO water can cause harmful conditions for being too sterilized if not chemically altered to fit the aquarium inhabitant’s need. Pure RO water must be added with the necessary minerals before it can be added to certain types of aquariums. Several ways of doing this is adding tap water, water conditioner, and other liquids that would suit your aquarium needs. Reverse osmosis systems don’t come cheap. Choose the one that is right for your tank since most reverse osmosis systems may cost you several hundred dollars. However, the cost will be worth it once you see the improvement of your tank’s water quality. You also have to consider the replacement of certain parts, most especially the membranes that usually suffer from wear and tear. You should also prepare to utilize the waste water since RO units produce large amounts of this. Wastewater contains all of the filtered minerals and nutrients which may be harmful for your tank inhabitants but great for watering your plants. What Are The Components Of A Standard Reverse Osmosis Unit? Membrane – The membrane is semi-permeable and strains all the impurities and contaminants from tap water, allowing only the filtered water to pass through. Flow Restrictor – This manages and allows pressure buildup in the unit. Flush Valve – The flush valve washes the deposits from the membrane. Pre-filters – This part removes the components of tap water that can cause damage to the membrane. Waste Water Outlet – Water that contains high levels of chemicals from the filtered water flows here. 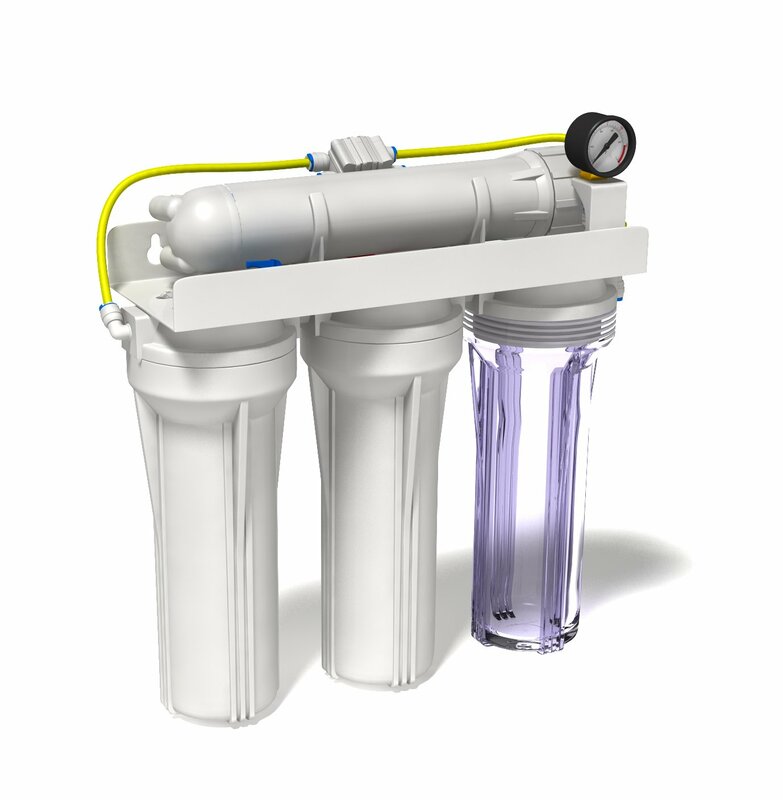 Product Water Outlet – Contaminant-free water with a total dissolved solids (TDS) with a level of 10ppm or below flows here. If you want to know more about the reverse osmosis system, here is a video that you can watch. You’re now set to choosing the best reverse osmosis system for your aquarium. There may be a lot of products being offered out there, but our review can help you narrow down your search. Take a look at our recommendations below. 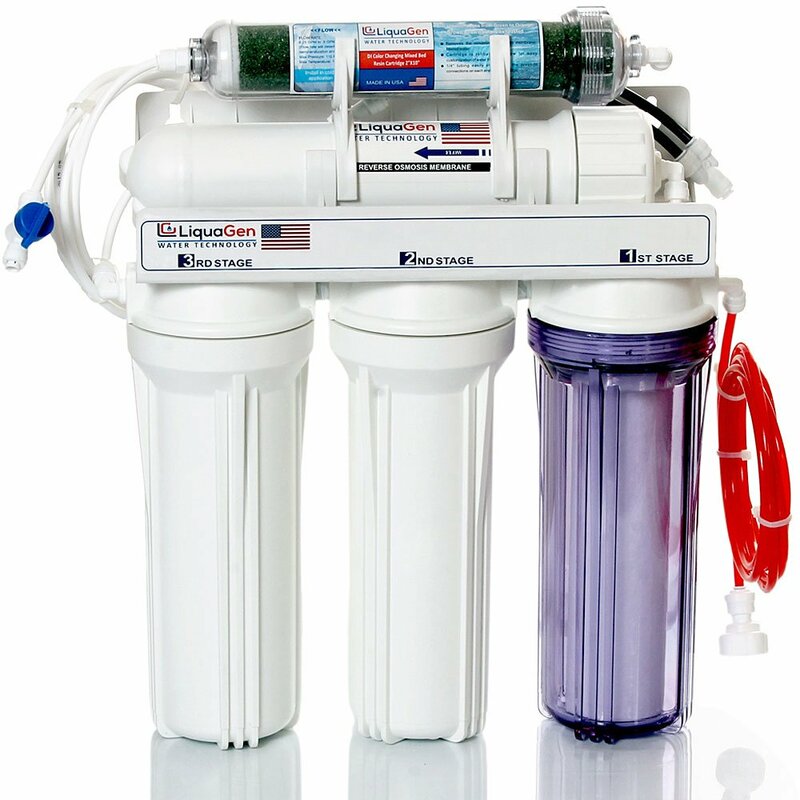 This product from LiquaGen is a versatile reverse osmosis filter. It is great for aquariums but it also its other uses, as long as high-quality purified water is needed, then this product will do the job. This product is ideal to first-time RO/DI users for its simple design. You don’t have to worry about the installation process since it is already a pre-assembled. It guarantees a TDS level of 0 ppm. It features a membrane capacity of 50 gallons per day (GPD) which is already a good number. If you worry about the warranty, this product comes with a manufacturer warranty good for 1-year. However, the auto shut off valve and the check valve are not included unless requested. Immediately produces the right pH for fishes after use. This product may seem pricey compared to its other counterparts. However, the SpectraPure Maxcap RO/DI System assures its buyers that it will deliver. It has a capacity 90 gallons per day (GPD). The membrane features a 99% high-rejection thin-film composite. Water conservation is also a key selling point of this product since it has a 2:1 waste ratio. It produces 50% less waste water and is equipped with an automatic in-line shutoff valve. It also has a manual flush valve. It has a no-rust mounting bracket. It has an in-line ball valve that enables manual system shut off and a float valve that can be used during unattended operation. The filter housings with a housing wrench enclosed are made of clear materials and a . As an additional perk, this product also comes with a 3-year manufacturer’s warranty. 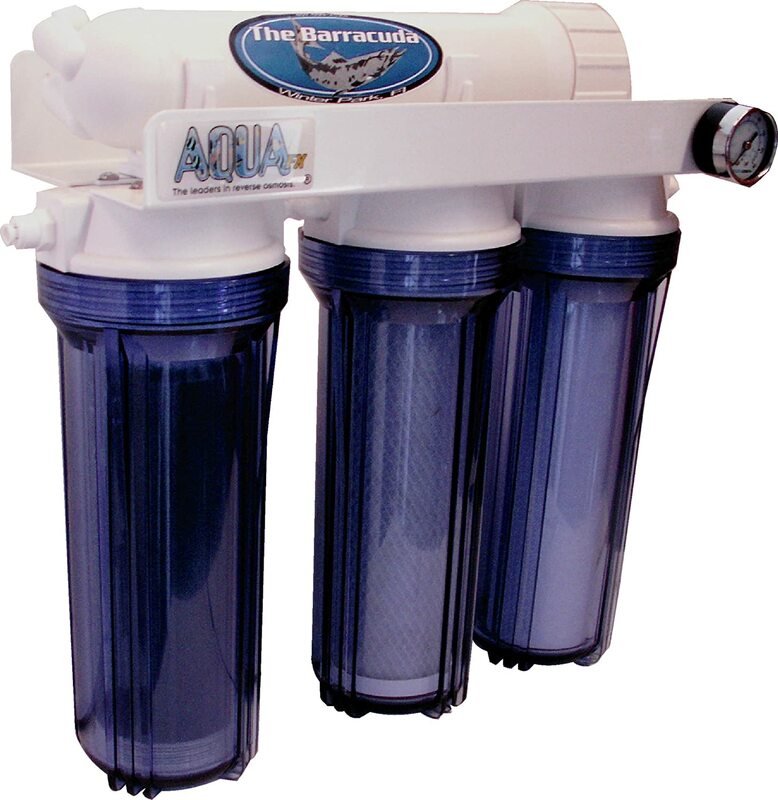 The AquaFX Barracuda (RO/DI) aquarium filter is a product that has a lot to offer. It is priced reasonably and has the following features, a membrane with high flow and high rejection rate, a 1-micron sediment filter with high efficiency, a chlorine guzzler carbon block filter, and a resin cartridge. It also has a pressure gauge of 160 PSI so that you can read the pressure coming from your water supply. The metal bracket is made of solid aluminum preventing it from rusting, which ensures the product’s durability . It also has a clear filter cartridge housing so that you can check on it if it needs to be replaced. For convenience, quick connect fittings and a filter wrench come along with the product. Works great on making your own saltwater. Produces large amount of waste water. The Aquatic Life RO Buddie has a compact design. It is also not that expensive compared to the other RO units in this list. It has a capacity of 50 gallons per day (GPD) up to 100 gallons per day (GPD). It boasts of a 3-stage reverse osmosis system that uses a Thin-Film Composite (TFC) membrane. Producing quality water is achievable with this RO unit. It also uses cartridges which are not hard to replace. Other features of this product include a faucet adapter, quick connections for easy removal and replacement of cartridges, mounting brackets to hold the unit securely so that you won’t have to worry about its placement, and a membrane housing wrench for easy cap removal. Requires less pressure to operate. Works great getting TDS to 0 ppm. The RO Junior packs a lot of features. It can provide up to 100 gallons per day (GPD) of filtered reverse osmosis water. It has a manual flush valve for an increase and extended membrane life. Checking the cartridge if it needs replacement is hassle-free with this product since it has a clear micron cartridge housing. It is equipped with an auto shut-off valve that stops incoming water supply after turning off the outflow. This feature is great for those who are cautious when it comes to wasting water. It comes with wrenches so that you can access the cartridge and membrane housings with ease. Also included are the garden hose adapter, 0.25 inch press fit connectors, a 0-160 PSI gauge for pressure reading, a built-in wall mount bracket, and a tubing for the plumbing set up. This product comes with a 1-year limited warranty upon purchase. Great at conserving waste water. Installing a reverse osmosis system for your aquarium can remove impurities from tap water and produces contaminant-free water. Purifying your water directly from your water source can be a big deal to your fish’ health. 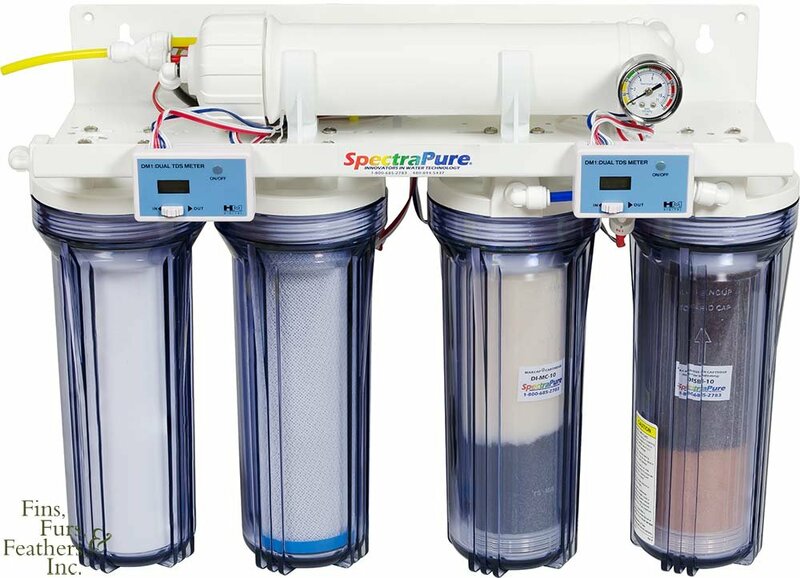 From all the products that we have reviewed, the top pick for this reverse osmosis system roundup is the SpectraPure MaxCap RO/DI System because of its easy set up. Its waste water reduction is an added bonus to its great performance. The quality parts of this product also make it durable. How about you? Do you agree with our top pick?